This 2 bedroom apartment is located in Tivat and sleeps 6 people. It has WiFi, a garden and parking nearby. If you are looking for wonderful hospitality, great location, close to the beach Plavi Horizonti (Blue Horizon) with very clean and comfortable apartment and great value for money, then you found your place - welcome to Maki Apartments! The nearest accommodation to beautiful sandy beach Plavi Horizonti! Situated away from the bustling areas, but only 10-15 min away from the sandy beach in the green area with beautiful mountain views. Just 5 minutes walk from the restaurant, 3 minutes from nice cafe bar and 10 min away from very well equipped supermarket. Quite neighborhood with tourist bus that take you to the Tivat town center. and many others that will make your stay even more pleasant and unforgettable! From Maki Apartments you are able to visit interesting places in our environment: Kotor Old Town, Porto Montenegro, Almara Beach. Central location on Montenegrin seacoast allows to visit other important places like: Budva, Cetinje, Tara canyon, Skadar Lake etc. We will be glad to assist in organizing these tours! 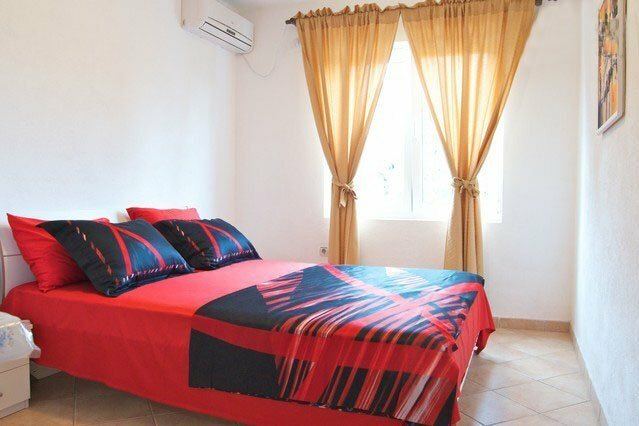 Apartment has two bedrooms where one room is equipped with king-size bed and another one with queen-size bed + 2 single beds. It is equipped with kitchen, bathroom and terrace. Free WiFi, Cable TV and DVD player are provided, as well as parking. It is perfect for up to 4 adults (for example two couples) or for adults with children (up to 6 persons). Served in your apartment, delicious meals will fulfill your enjoyable stay in Maki Apartments. You will be able to enjoy in taste of real domestic cuisine! At the airport driver will meet you with a sign MAKI APARTMENTS. Flight delay does not affect the costs of services! Maki Rent-a-car offers a full range of services with unlimited mileage. Car rental can be done directly at the Tivat Airport, as well as a free shipping to many locations in Montenegro (Tivat, Kotor, Budva,...). Quality cars, affordable prices, friendly relationships with our clients as well as a professional staff are a good enough recommendation for the use of Maki Rent-a-car.